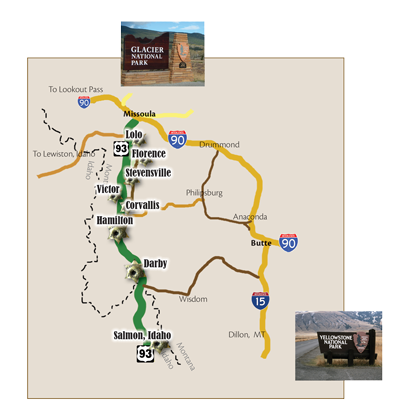 Plan your vacation today - Visit Montana's Beautiful Bitterroot Valley - From River to Ridge it's a Beautiful Day in the Bitterroot! Go directly to the Old West/Gift Montana Shopping System! 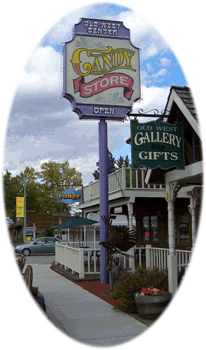 The Old West Gallery & Antiques Inc., nestled in the majestic Bitterroot Mountains in Darby Montana has over 16,000 square feet of old west gifts, antiques, furniture, collectibles and much more! They also have a true old west candy store that offers over 600 kinds of candy, chocolates, and fabulous home made fudge! The Old West Gallery & Antiques, Inc., nestled in the majestic Bitterroot Mountains in Darby Montana has over 16,000 square feet of old west gifts, antiques, furniture, collectibles, and much more. We also have a true old west candy store with over 600 kinds of candy, chocolates, and fabulous home made fudge. Although we can't offer everything on line, we are in the process of creating our web site so that we may offer a few items for you, both in our gallery and in our candy store. Please be patient with us. If there is something you have seen in our stores, please feel free to write, call, or e-mail us. The address and phone are below. Make someone happy with delicious homemade fudge or creative gift baskets from the Old West Candy Store on Main in Darby, Montana. The Fudge and Chocolates are homemade from the finest ingredients with loving care. From personal gift baskets to corporate and event treats the Old West Candy Store will keep you happy. It's a beautiful day in Montana's Bitterroot Valley!